Drew and I love recording and publishing our podcast episodes, and have done so for almost thirteen years! We don't always publish on Mondays as we would like. Sometimes our travel to conferences and other venues interferes. Just know that we are dedicated to always provide the best new content to you, our listeners, as soon as we can. We are also confident that our sponsors are the absolute bet in the genealogical community, and we hope you investigate their offerings. As an example of a current delay, Drew has been at the American Library Association Conference in New Orleans since Thursday, 21 June 2018, and won't return until late Monday, 25 June 2018. He is a leader in the ALA Genealogy functions, and he is also the Genealogy Librarian at the University of South Florida Library. As one of the winners of the prestigious Filby Award for Genealogy Librarianship, he is one of the very select few exemplary leaders in the library and archive world. George has been recently engrossed with home improvements - wallpaper stripping, wallboard word, and prepping for interior painting tomorrow (Monday, 25 June 2018). George, is an internationally recognized expert and expert presenter all over the US, Canada, on cruise ships, and on webinars. He is author of 12 books and regularly writes for four genealogy magazines. His most recent publication is as a chapter author in Professional Genealogy: Preparation, Practice & Standards edited by Elizabeth Shown Mills and destined to be a seminar publication in our industry. We will record the next episode on Tuesday, 26 June 2018, and publish as soon as we can. Drew has also been scheduling new guests for the Genealogy Connection podcast. We have so many new topics and interviewees coming! 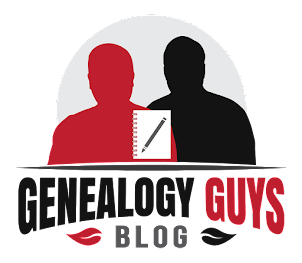 In the meantime, stay engaged with our new Genealogy Guys Blog here at http://blog.genealogyguys.com/. Click on the green F icon to subscribe via Feedly. I can promise you new content between podcast episodes. There will be news stories, tips, methodology suggestions, important websites to bookmark for future use, organizational tips from Drew, and DNA education to help you grasp, master, and apply this newest tool in your toolbox. Thank you for being our followers and fans! Drew and I are committed to providing our podcasts and blogs to the genealogy community for free.